The 24-Hour Mommy: Give your child the winning edge! I'm sharing with you what I believe is a worthwhile workshop for educators and parents alike. Thanks to Galileo Enrichment Learning Program for sharing to us this wonderful event. Build the next generation by equipping them with the right skills and knowledge. The Galileo Enrichment Learning Program invites you to a two-day conference on “Giving Children the Winning Edge”. It will be on October 1 and 2, 2010 at SGV Hall, AIM Conference Center, Benavidez cor. Trasierra Sts., Legaspi Village, Makati City. 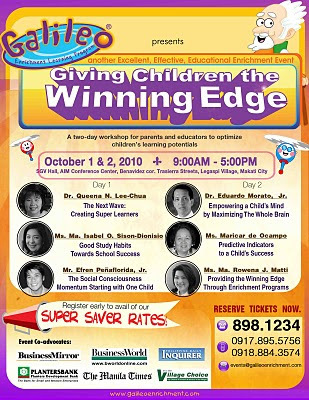 Speakers for the two-day conference will be Dr. Queena Lee-Chua, Ms. Maribel Dionisio, Dr. Eduardo Morato Jr., Ms. Maricar de Ocampo, Ms. Rowena Matti, and "CNN Hero of The Year," Mr. Efren Peñaflorida, Jr.
Every child has the capacity to become a “super learner” – an articulate speaker, a critical thinker, a problem solver, a fluent writer, an effective reader, a speedy mathematician. Get inside information on how to strengthen their capabilities and motivate them to become super learners. Guiding a child up the ladder of success requires discipline. See a different side to the word ‘discipline’ that will establish a child’s winning attitude. Each child is unique and has his own style of learning. Maximize his brain’s potential by understanding its inner workings and create an exceptional child who is a cut above the rest. Every parent and educator should be able to pinpoint characteristics that motivate children to become the person they want to be. Use these highlights in their lives as a guiding tool towards a confident and successful future.